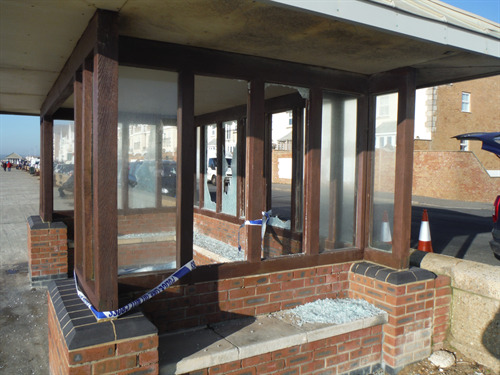 Over the Christmas holidays a spate of vandalism occurred to the seafront shelters opposite Ringmer Road and The Causeway in Seaford. The first incident occurred around the 12th December which was reported to Sussex Police. Unfortunately this was not the only incident with more vandalism occurring on the 23rd December, then on the 28th December youths were witnessed causing more damage, to which Sussex Police are currently following leads. 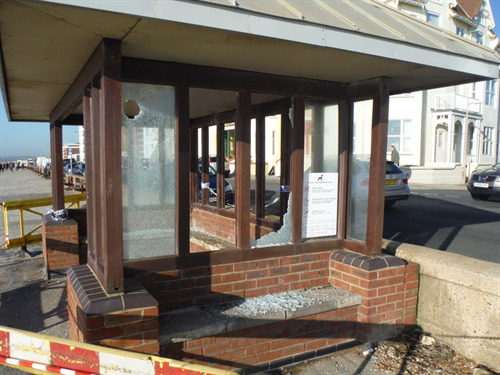 There was significant damage caused to both shelters with a total of 23 panes of glass being smashed between the two. The last incident occurred over the weekend of 3rd/4th January 2015 with no known leads. Costs are being finalised for the replacement glass, which will be in excess of £1,500. 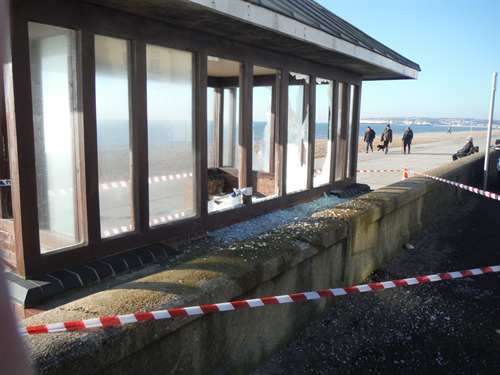 Seaford Town Council is looking at other options for glazing the shelters as vandalism of this nature has been a problem previously. Due to the number of offences occurring within such a short space of time; would anyone with any information relating to the incidents please report it to Sussex Police either via email 101@sussex.pnn.police.uk or call 101.